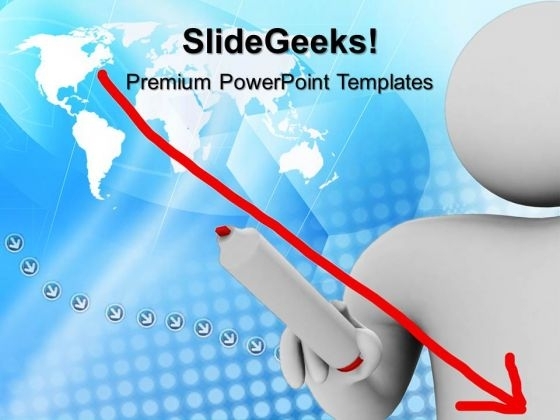 3d Man Global Business PowerPoint Templates And PowerPoint Themes 1012-This template with an image of 3d man drawing a down bar graph helps you chart the course of your presentation. This image represents the downfall of the business or financial crisis. Our stunning and unique image makes your presentations simpler and professional showing that you care about even the smallest details. This template signifies global business, finance, marketing, statistics, strategy and success.-3d Man Global Business PowerPoint Templates And PowerPoint Themes 1012-This PowerPoint template can be used for presentations relating to-"Global business man, earth, business, glabe, technology, success" Claim your prize with our 3d Man Global Business PowerPoint Templates And PowerPoint Themes 1012. You will come out on top. Our 3d Man Global Business PowerPoint Templates And PowerPoint Themes 1012 epitomize your personality. They bring to life your firm beliefs.